All of my Christmas decorations are up and the gifts have taken over my bedroom closet. I need to start wrapping presents ASAP. I’ve been making lists and checking them twice. So, the countdown to holiday get-togethers with family and friends is on. One recipe I can always count on is Southern Pineapple Casserole. If you’ve never had it, you’re in for a treat. Parties and get together’s are so much easier when they’re semi-homemade. For instance, a few weeks ago, I had the entire family over for Sunday lunch. That’s five children! I have two sons-in-law, one fiancé, one girlfriend, four grandsons, one husband and me. Yes, fifteen total! We’re a close-knit family and we love to catch up with each other on Sunday’s over a home-cooked meal. It’s even more special during the holidays. Yes, I admit that I wanted to show off my holiday decorations, too. 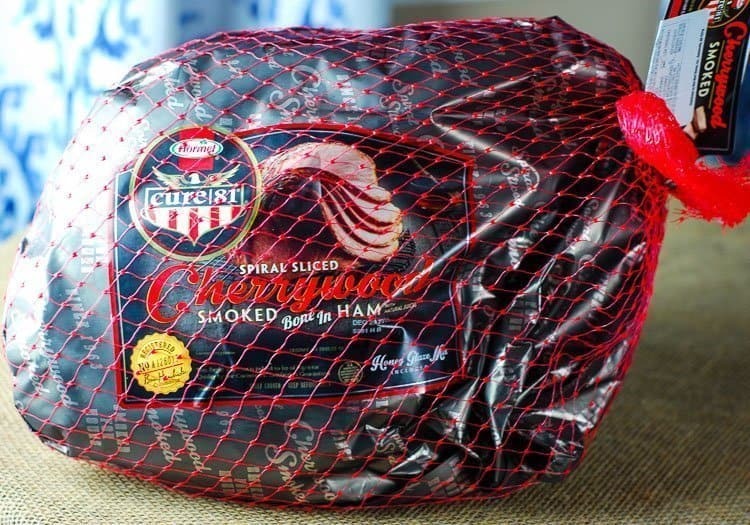 The entire family is crazy about ham, so when I was in Walmart with a grocery list in hand, shopping for Sunday lunch, the pretty packaging of Hormel Cure 81 Bone-In Cherrywood Flavor caught my attention. And when I saw that it was fully cooked (heat according to package directions) and spiral-sliced, I was sold. My husband, bless his heart, is always in charge of slicing the ham. I’m a helicopter wife, hovering and trying to tell him how to slice it. He was relieved to know that Hormel Cure 81 is presliced and our marriage will be happier because of this convenience. The one side dish I always serve with ham is Southern Pineapple Casserole. Everyone who’s ever had this casserole loves it and wants the recipe. And now, you’ll have the recipe, too. Casseroles are always fun and easy to make because all you do is mix the ingredients together and bake. For this particular casserole, I combine the ingredients in one bowl. Start by mixing together sugar and flour. Add cheese and pineapple and mix well. Place in a 9×9 baking pan and top with crushed butter crackers. Pour melted butter over the crackers and bake at 350º for 30-35 minutes. Add a tossed salad and rolls to go alongside the ham and southern pineapple casserole. Dinner is served! 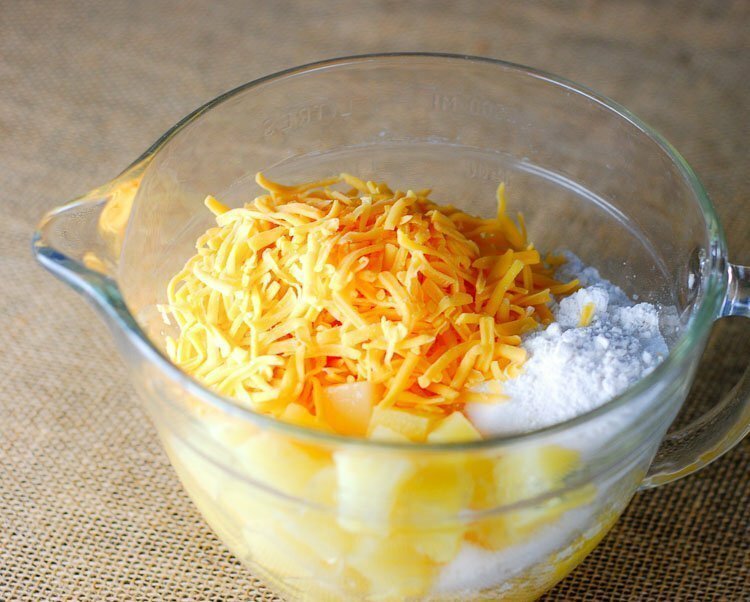 Add cheese and mix with drained pineapple chunks. Top with crushed crackers. Pour the melted butter over the crackers. Here’s the finished product! 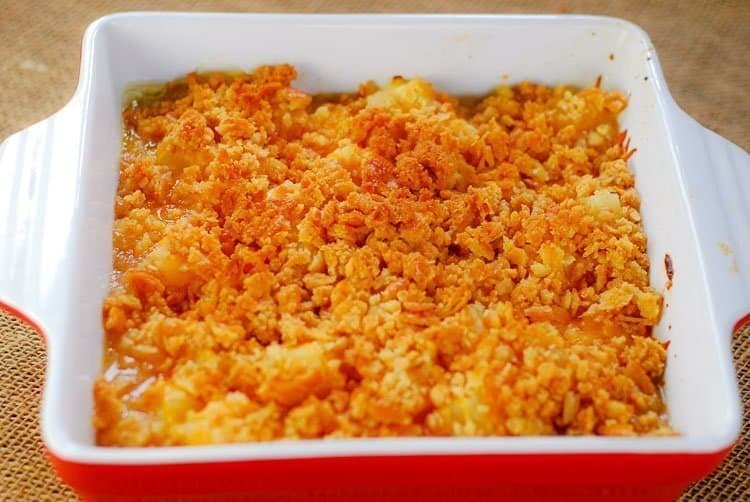 The cracker topping is crunchy and the pineapple/cheese mixture is slightly sweet and tangy. It’s a family favorite during the holidays and all year long. My Sunday lunch get-together was the first time I served a Hormel Cure 81 Cherrywood Ham. The son-in-law declared it the best ham he had ever tasted. My husband said, “What did you do differently with this ham? The entire family agrees that it was the most delicious ham they had ever eaten and immediately requested it for our next get-together. And all you do is heat it according to the package directions. It’s so easy, right? Be sure and try my Southern Pineapple Casserole recipe during the holidays. It’s the perfect side dish to your Hormel Cure 81 ham and your dinner guests will be talking about your party long after it’s over. 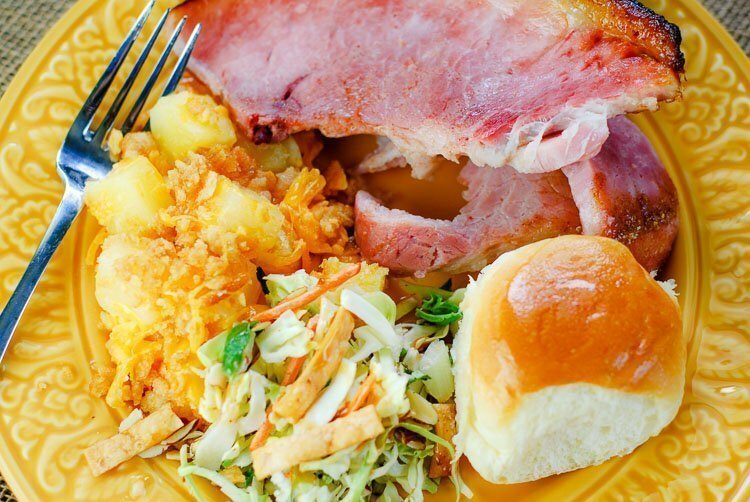 What’s your favorite way to serve a Hormel ham during the holidays? You May Also Like These Holiday Desserts! I’m totally getting hungry now. That casserole looks and sounds so delicious! And that ham is totally a winner! I’ll look for it the next time I’m at the store! This sounds so good! I love anything with pineapple in it. What a great casserole. My daughter loves ham and only really gets it at holiday dinners. I’m looking for a new side dish and this just may be it! Thanks for the recipe! Tonya C recently posted…Merry Christmas Jelly Bean Bar + FREE Printables! Wow! This is the first time I’ve heard of pineapple casserole! This looks like an awesome blend of flavors. The southern pineapple casserole looks really tasty. It pineapple can surely add more flavor to the ham. This sounds so delicious and interesting. I have never seen a Pineapple Casserole – southern or otherwise – and I can’t wait to try this one out on my family! I just love ham. This looks like an amazing meal! My husband loves pineapple and ham together, so I know he’d devour this. Ooo, that looks delish! And it can pass for breakfast, right?! I mean…fruit…! Kristen from The Road to Domestication recently posted…Christmas Holiday Shelf! 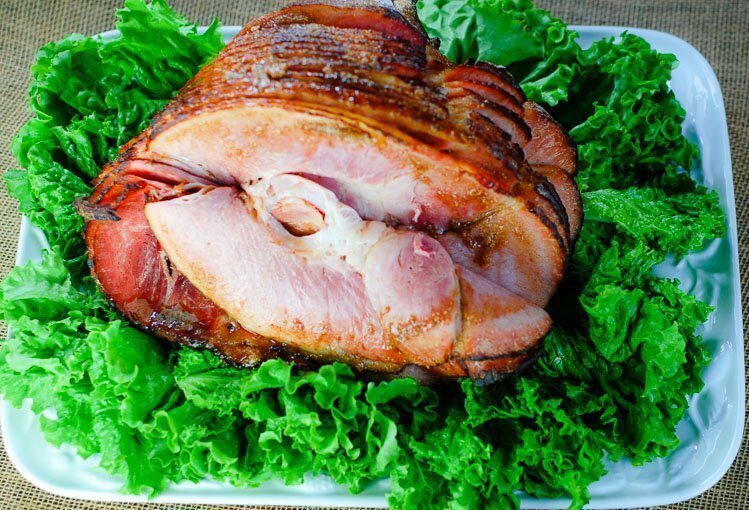 We love having a family ham dinner and this sounds like a great side dish to try. I’m always looking for new recipes! Jessica Harlow recently posted…Design a book that is personal to you with Mixbook! What a great recipe, i love pineapple too!!! 🙂 I cant wait to try the Southern Pineapple Casserole at home, it sound really tasty, yummy. That Hormel Cure 81 ham looks absolutely delicious! I really want to try your Southern Pineapple Casserole recipe as we love pineapple at our house! I wish I had a slice of this entire meal. It looks great. I love slices ham and that cherrywiod flavor sounds delish! You hubs will be happy! Gawd that ham looks good! We still don’t know what we are cooking for our Christmas party. I’m thinking of having a nice looking ham. I love pre-sliced hams. I get very particular about how my meat is sliced and this makes it so much easier! 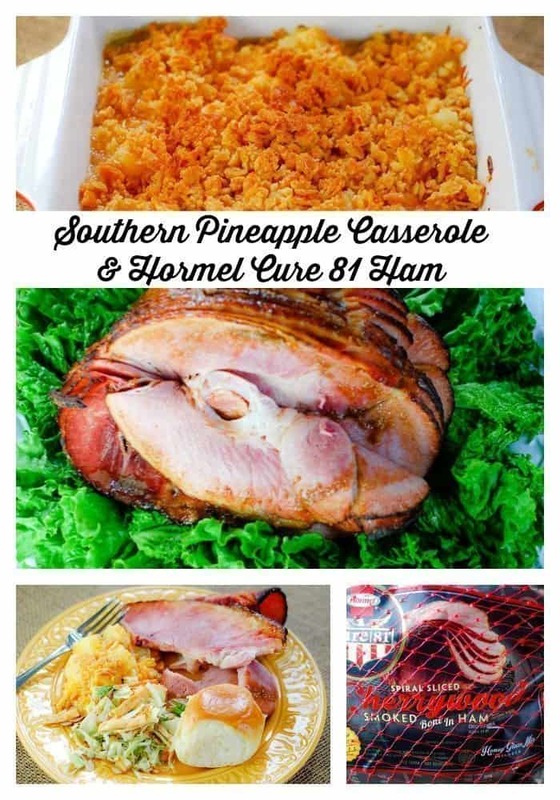 The pineapple casserole looks delicious and I can totally see how it would compliment a ham. WOW! This is so unique. I truly would have never thought to create something like this but now it is a MUST try this Summer for a cookout! Thanks for the awesome recipe.